This Valentine’s (and Galentine’s Day) I am celebrating my new staff, and how much I appreciate them. Throughout the job search process we are constantly reminded about “fit,” and being the professional worrier that I am, I was worried I would not find my fit. Fortunately, at the University of Nebraska-Lincoln (UNL), I found the perfect fit – and I could not be happier. While I miss my student staff of Academic & Career Information Center from the past two years, my current staff is everything I could have hoped for when I interviewed almost a year ago. My co-advisors are a team of support, guidance and connectedness. We are a close team that has an open-door policy and we are not afraid to ask each other for help. I greatly appreciate the fact that I do not have to be afraid of not knowing the answers and I can bounce into someone’s office and ask for help. I have a supervisor that is invested in my growth as a professional, and I look forward to our weekly 1:1s to discuss my growth and professional and personal goals. 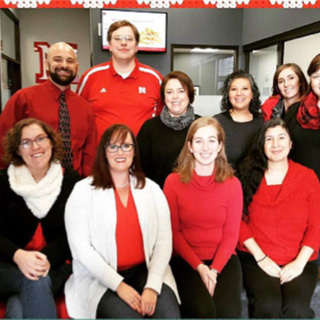 Our career coach is a valuable asset to our team, to provide academic and career advising in one spot for our students, and also my UNL best friend. She has gone above and beyond to make me feel welcome in my new home. Our front office staff, and pair of student workers, create the welcoming and team-oriented environment as soon as you walk into our office. Lastly our director leads us to be the best advising unit on campus. Together we are a strong team, and I am grateful to be a part of it. Not everyone finds that fit right away, and that’s ok – but continue to work hard to find this staff love and perfect fit for you. When you are part of a team that values you, pushes you to grow, and support each of you, that is when you are at your best. This Valentine’s Day I hope you find, and maintain that staff love – you deserve it.